SeniorsAloud: ELVIS IS STILL IN THE BUILDING! 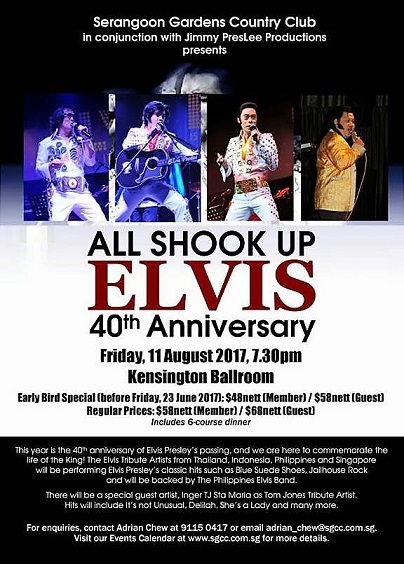 What an evening it was at the Elvis 40th Anniversary 'All Shook Up' tribute last Friday 11 August 2017. 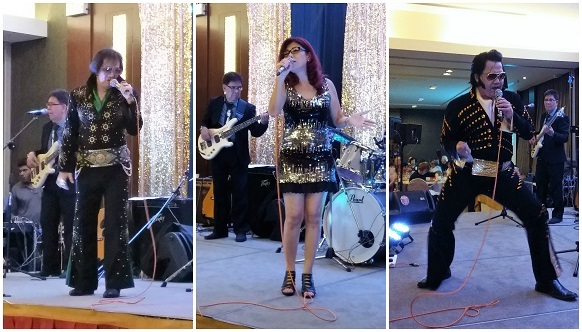 The ballroom at Serangoon Gardens Country Club shook, rattled and rolled to Jailhouse House Rock and Love Me Tender, and all the hits from an era beloved by the baby boomers all decked out for a rollicking good time. 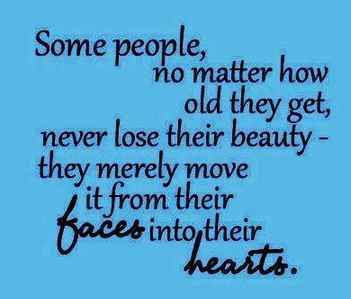 And that they certainly did, thanks to Jimmy Preslee Productions. 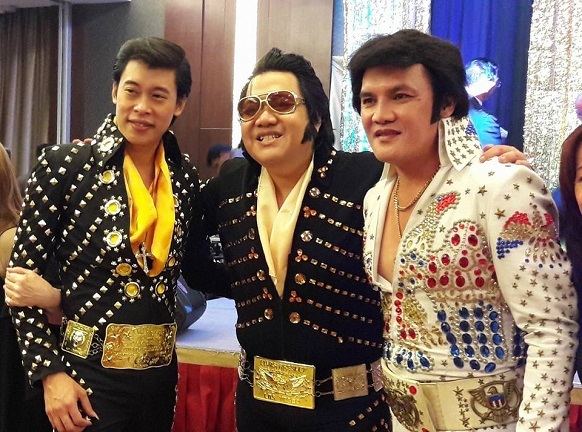 They brought in four top Elvis Tribute Artistes (ETA) from Thailand, Indonesia and Philippines to entertain the audience, together with two ETAs from Singapore. I first heard about the event from a good friend Dr Pok Tham Yien from Johor Baru. I have always been an Elvis fan. Of course I wouldn't want to miss the event but tickets were already sold out weeks in advance. 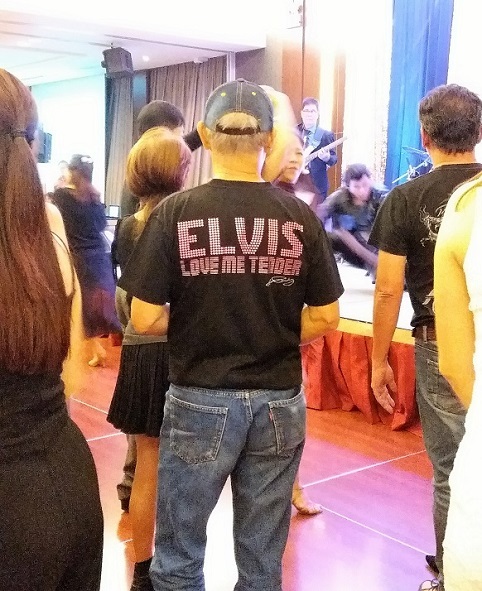 Yes, Elvis still lives on in the hearts of his legions of devoted fans. I can't think of anyone in the music pantheon that has left behind such a global following, one that has remained undiminished long after their demise. success, and paved the way for subsequent tribute concerts. 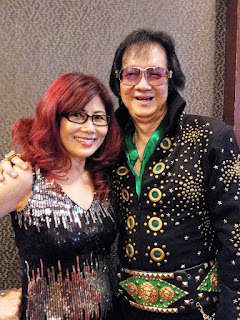 As luck would have it, Jimmy Lee, the organiser, turned out to be from my hometown Batu Pahat, and my cousin's ex-classmate at BP High School. He called me up with the good news that Judy, his lovely wife, had a ticket for me. One of her friends couldn't make it for the event. We met up at Sim Lim food court on 31 July. It was over lunch that I discovered how Jimmy Preslee Productions (JPP) came into being. It all started in 2009 with Jimmy's love of karaoke, especially singing Elvis songs. 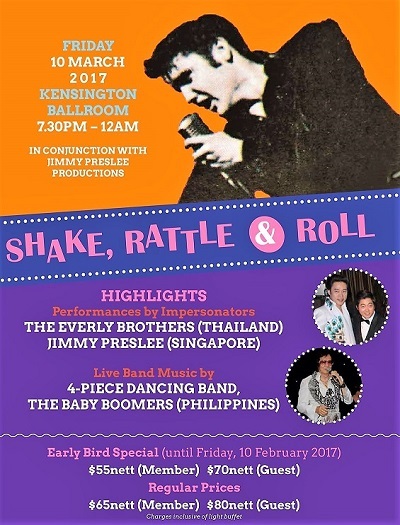 One thing soon led to another, and he was invited to perform alongside other Elvis performers in Hongkong, Manila and Penang. To cut a long fascinating story short, Jimmy saw the demand for such shows. So he became a show agent and in 2014 organised the inaugural tribute 'Elvis is Back in the Building' under Jimmy Preslee Productions (JPP). 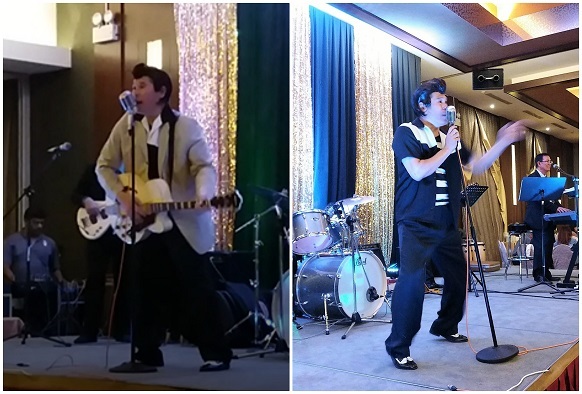 It drew such overwhelming response that it has become a JPP staple to feature two Elvis tribute events a year. 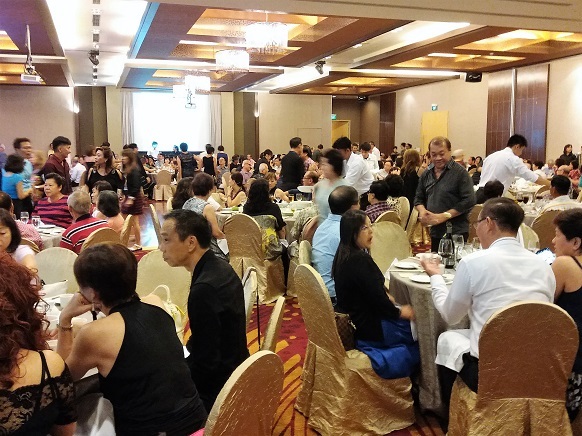 A sold-out event. Can't go wrong with an Elvis tribute. Baby boomers love songs that bring back fond memories of the 1960s era. I asked Judy what is the difference between an Elvis impersonator and an Elvis artiste? 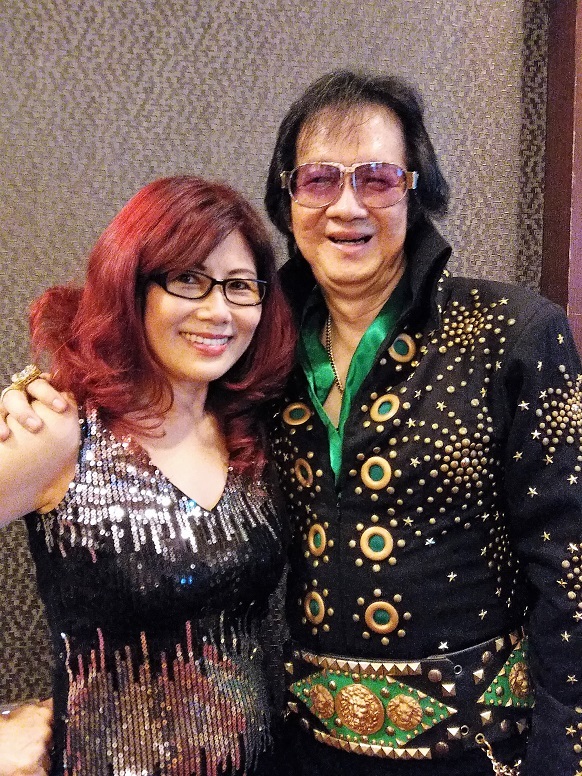 Her quick reply: 'Elvis impersonators usually exaggerate and do some clowning around. 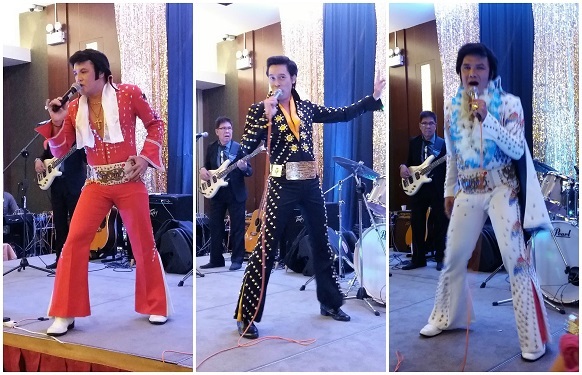 ETAs don Elvis outfits and try to sing Elvis songs just like the King himself.' Ok. Got it. 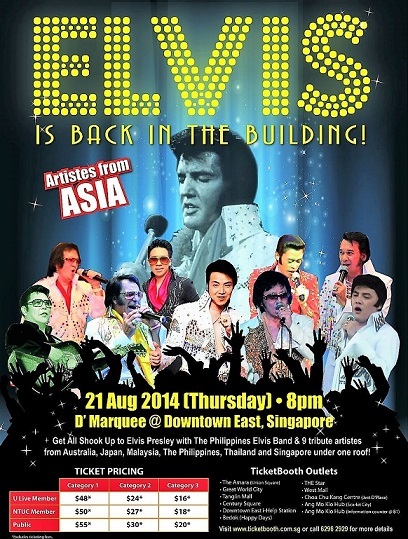 ETAs are serious professionals whose mission is to keep alive the legacy of Elvis Presley through songs and concerts. I have listened to many ETAs over the years, and I must say some of them are really incredible. They sound and look almost like the King himself. Judging from the enthusiasm of the audience, especially the ladies, it was an evening to remember - a marathon singalong and dancethon. 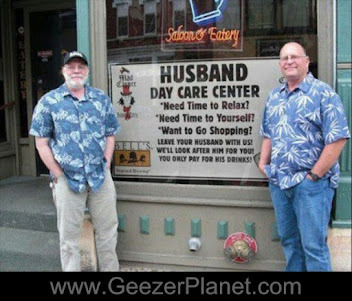 These baby boomers sure know how to have a fabulous time! These ladies definitely have Happy Feet. They kept the energy and fun level high the entire evening. A tough act for the guys to follow! The ETAs were not the only ones on stage. The good-looking duo of ELVICH and KNIGHT PHATIHATAKORN from Thailand were a big hit with the ladies. They sang 'Let It Be Me' and 'Sound of Silence' and had the ladies literally swooning! Special mention must be made of the band BABY BOOMERS, also called the Philippines Elvis Band. They provided excellent backup for all the singers and performed a couple of songs on their own too. 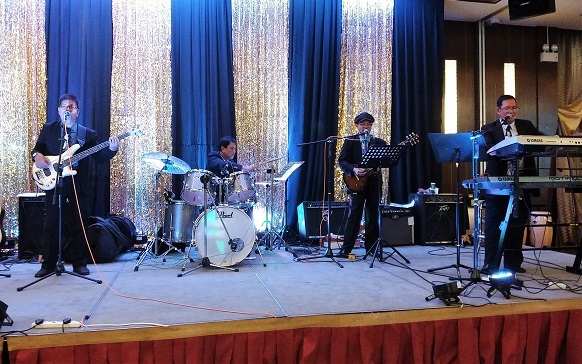 On keyboard is band leader Lui Simbulan, with Gerry Yap on lead guitar, Bork De Leon on bass guitar and Tim Ponce on drums. Both Gerry and Bork sing in the band. 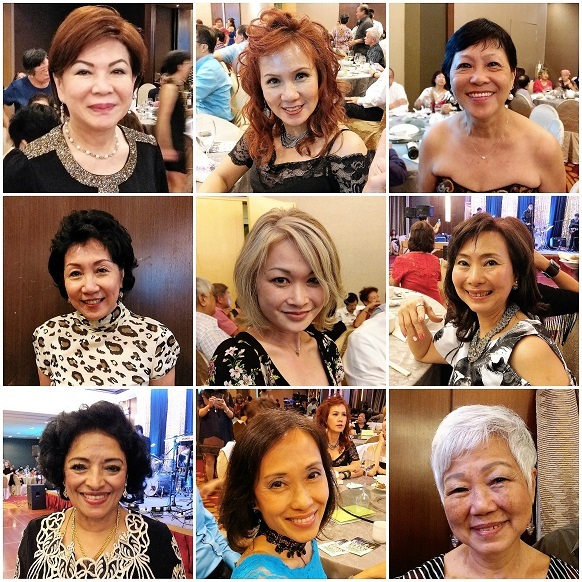 As I made my way around the ballroom, what caught my roving camera eyes were the many gorgeous ladies of Singapore. Here are pictures of some of them, all taken with their knowledge and permission. It is invariably the ladies who determine the success (or failure) of a dinner and dance event. If the ladies don't dance because the music is terrible, the event is heading for one big yawn. Some of the lovely ladies I spotted in the ballroom. Too many photos to post all here. This is the second Elvis tribute this year, so that means Elvis fans in Singapore will have to wait till 2018 for the next one. I am sure JPP is up to the challenge of giving loyal Elvis fans another unforgettable tribute as successful as, or perhaps even more successful than 'All Shook Up', if that is possible. If you are a die-hard fan and can't wait, make your way up to Kuala Lumpur. I hear there are Elvis tribute shows this weekend. 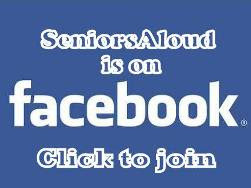 Check out our SeniorsAloud FB page for more details. 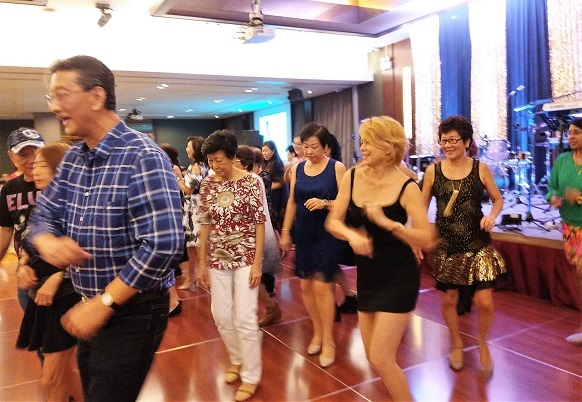 Ladies (and guys), if you are reading this and would like to learn line-dancing or join a line dance group in Singapore, I can put you in touch with Judy. 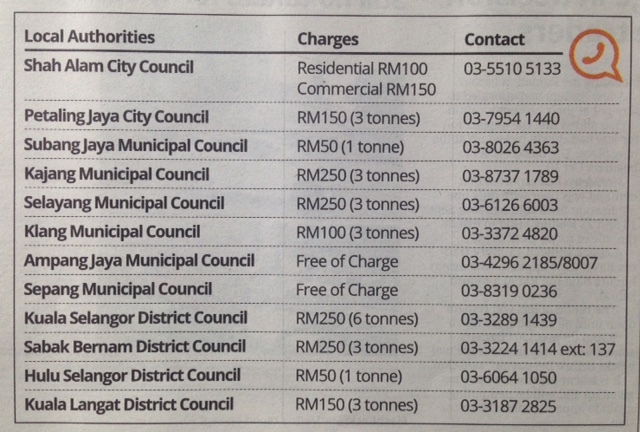 Contact me at 012-3068291 (only whatsapp messages, please). For Kuala Lumpur/PJ, I can recommend my club that teaches line dancing and ballroom dancing as well. As my cousin Lawrence puts it, "At our age, we should be rocking around the clock!" Agree absolutely, Life is for living, not for existing. And to Jimmy and Judy: don't keep us waiting too long for the next Elvis tribute, or he will have left the building! Labels: Elvis Presley tribute concerts, Jimmy Preslee Productions.